Accra, Dec. 16, GNA - The Ghana Football Association (GFA) on Thursday, outdoored Ratomir Dujkovic, a Serbian as the new coach of the Black Stars. Coach Dujkovic who assumed duty on Thursday replaces Portuguese Mariano Barreto who deserted the Black Stars in September. The Serbian arrived in the country on Tuesday and signed a two-year renewable contract with the G FA on Thursday morning, Mr Kwasi Nyantakyie, Vice Chairman of the FA announced at a crowded press conference at the Ohene Djan Sports Stadium Accra during the ceremony. The coach, whose last appointment was with the Rwandan national team, which he guided to make their first historic qualification to the Africa Cup of Nations in Tunisia in 2004, has been tasked, to primarily qualify the Black Stars to the World Cup in Germany in 2006. 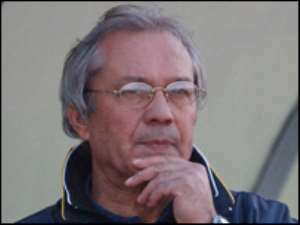 Though his salary was not made known to the media, GNA Sports has gathered that the Serbian, best remembered for leading the Rwandans to register a home victory over the Black Stars during the last Nations Cup qualifier with a historic 1-0 win would earn about 15,000 dollars, a figure which officials were tight lipped on. The one time coach of the Venezuelan national team and a nominee for last year's Confederation of African Football (CAF) best coach award is expected to name an assistant and other support personnel in the next few days. Dujkovic would have the opportunity of meeting all club chairmen and coaches as part of the association's quest to create the needed conducive atmosphere to enhance his job. The coach whose track record with the Southern Africans is believed to have given him the edge over 45 other applicants was buoyed about the chances of the Stars in the qualifiers during the briefing. Though he believed the Stars could amass 14 out of the 15 points in the remaining five games to qualify for the World Cup, Dujkovic admitted that it would be a difficult task to accomplish, but added, "If I did something historic in Rwanda, why not with Ghana." The Serbian is poised to ride on Ghana's past credentials and what he described as "over 200 known and unknown stars plying their trades in Europe and the solid domestic league to do something special." Dujkovic, last month had the nod over highly favoured Frenchman Philip Troussier and Ghanaian Bashiru Hayford who made the last three in the race for the national team A job. His first major assignment would be a crucial World Cup qualifier billed for Kinshahsa against the Democratic Republic of Congo in March next year. The Stars currently lying second on the six-team table with eight points from five games, would be away to the Bafana Bafana of South Africa, Cape Verde and host Uganda and Burkina Faso in the remaining five matches.